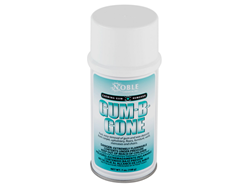 Noble Chemical Gum-B-Gone features a unique blend of freezing agents to quickly remove the tackiness from gum and wax without harming or staining surfaces. Great for schools, office buildings, and hotels, Gum-B-Gone makes it easy to remove substances that may otherwise be impossible to get rid of. This product is also environmentally-safe, so you don't have to sacrifice quality and price to be green.